65 Hours of non-stop racing. On-the-clock expedition adventure racing always requires striking a balance between efficiently moving forward with maintaining enough cognitive capacity to make smart decisions and navigate accurately. As darkness fell, 60 hours after the race began on Thursday morning, we approached a class III rapid on the Deschutes River in our tandem Alpaca packrafts. By then, we were definitely on the wrong end of cognitive capacity as we decided to run the rapid, instead of portaging, despite the inability to see and thus read it…. Chaos ensued. 8:00 AM Thursday morning- The race began beside a nondescript road in the middle of nowhere specific, deep in the Willamette National Forest. 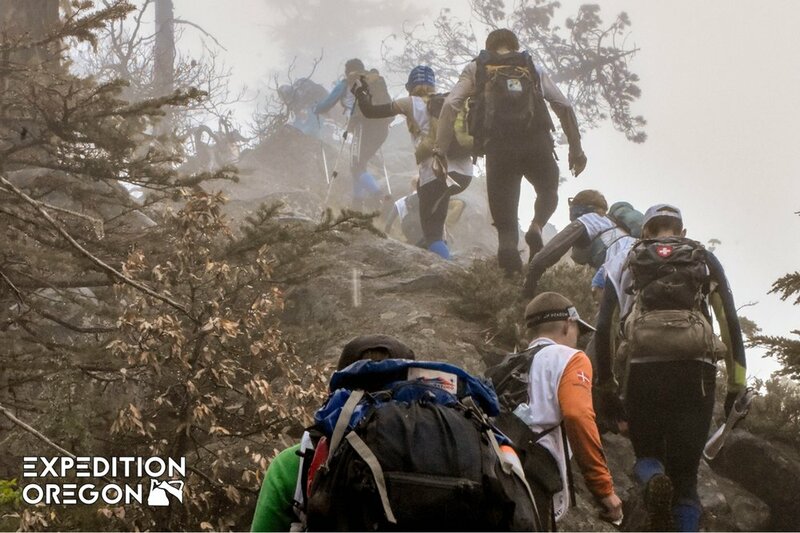 21 teams launched up a heavily wooded South-facing slope, climbing 1800+ feet in less than a mile, often on hands and knees and dodging debris dislodged by the teams above. Bones was the first to reach the top but was quickly caught by Merrell, Bend Racing Canada, and Quest AR as the frigid mountain mist enveloped the area making navigation a challenge. Over the course of the next five hours, we traded positions several times on the way to the McKenzie River and TA1. Frigid conditions and light snow conspired to freeze our parts and break our resolve. 12:42 PM Thursday – We arrived at the river about 20 minutes behind Merrell, blew up our packrafts, and jumped into the quick-moving McKenzie River behind Merrell and a couple of minutes ahead of Bend Racing and Quest AR. We opted to use two Alpaca open-cockpit boats. The McKenzie ended up being a fast-moving Class II river, requiring solid water skills to stay fast and upright. Regardless of our attempts to avoid the larger holes, our boats would quickly fill with water and we would need to pull over and dump the boats so they could act more like boats and less like submarines. This kayaking section, which included a couple of bushwhacking portages, took five hours to complete. Quest AR, which had opted for sleek, skirted Alpacas grabbed the lead- definitely the right boat choice for the McKenzie. All four lead teams flipped at least one boat in a specifically nasty class III, chilling those who swam it to the bone. The bikes at TA2 were a welcome sight heading into the night. 6:00 PM Thursday- We began with a 3,600-foot climb to the top of a local peak, the next 30 miles and 10,000 feet of elevation gain through the night took us 10+ hours and often involved a bike-whack through the dense Oregon bush. Mid-way through the bike leg, we hit a climbing section where one teammate would need to perform a Class II rock scramble and one a 5.9 technical climb. Liza and Charles would crush the challenge, scampering up the respective rock faces without issue. 4:20 AM Friday- We departed from Tombstone Sno Park on foot and climbed to Browder Ridge where the morning panoramic views almost compensated for the jungle of Devils Club we fought through on our way up. A slight navigation error set us back about 20 minutes and any thoughts of speeding up to make up the lost time were dashed by the off-trail fight through slide alder and manzanita bush and the slog along a forgotten and heavily overgrown road of yesteryear. The 16 miles took us a snail’s pace 8 hours, putting us into TA4 just after noon on Friday. 12:47 PM Friday- We were back on the bikes for another 3,000 feet of elevation gain along the historic Old Santiam Wagon Road where we arrived at the orienteering area in the late afternoon. 4:43 PM Friday- We arrived at the orienteering loop at the same time as Bend Racing. Eight checkpoints disbursed among lakes, dense brush, overgrown roads and steep terrain. We made quick work of the first six and were headed back to our bikes as darkness fell on the way to our seventh point. Sleep deprivation/distraction/darkness – whatever the cause, we ended up well north of the large lake where CP2 (our seventh point) was located. As we tracked back to our last known spot, we were able to find the lake, approaching from the south. The approach to the CP from the south, however, was hindered by a swamp that forced us to go back around from the north. All told, we lost 45 minutes and a bit of motivation. We decided to grab a quick 30-minute sleep to regroup before the massive upcoming bike leg. We jumped into the shed to find Team Dart sleeping before they headed out for their orienteering attempt. Dart’s Aaron Rinn’s snoring shook the shed as we tried to lie down. Then 15 minutes into our “sleep” Dart decided they had better get going and took the next 15 minutes to rouse and make as much noise as possible getting their gear together. We left the cabin hardly refreshed. Leaving just after midnight, we were back on our bikes and navigating a maze of old fire roads that crisscrossed and climbed, and climbed, and climbed. We ultimately arrived at the rappel site. Bikes attached to our backs, we dropped the 150 feet to the last leg of our biking section. The final few hours to the river was an amazing groomed downhill, crammed with bumps, berms, jumps and sweet flow. It energized us and ALMOST made all of the climbing worth it. As we approached the transition area, it was growing dark and we discussed the lunacy of packrafting “Big Eddy” at night. The rapid, a Class III series of three holes looked fine when we scouted it before the race so long as we held river left. Anything down the middle was big water and likely a swim. Our decision was to portage around Big Eddy through the lava fields. When we arrived, Bend Racing had just finished the run without flipping and Quest had portaged and been caught by Bend Racing. Quest and Bend Racing ultimately decided to travel together to the finish, a short five-mile bike ride. Maybe it was the excitement of almost being finished, maybe it was the encouragement and promise of having sufficient safety personnel available, or maybe it was our sleep-deprived lizard brains anxious for one last shot of adventure, but our previous decision to portage around the rapid was scrapped and replaced with a desire to run it. Before running it though, we had to get there. A 40-minute run to the put-in and 10 minutes of blowing up the boats took us to 9:10 PM before we were on the water. Shadows and reflections guided us downriver to the top of Big Eddy. Daniel from Explore Oregon met us at the top of the rapid and confirmed that we wanted to run it. We did. Instructions were to follow his line. We tried, but in the darkness, it was hard to even see his boat beyond 20 feet and then it disappeared down the first hole. Jason and Liza were the first to drop in and Charles and I followed. Unable to see any of the rapid, it was blind faith. And then carnage. Our boat exploded in the first hole, ejecting Charles and myself and our two packs which were connected together and to the boat. As a long-time raft guide, floating class III rapids are standard practice. But at night, things are different. My knee popped hard on a rock underwater and nearly stole my breath. Knowing that the second hole was approaching, I managed to grab another mouthful of air before going down again. Another rock. Resurfacing, I could see Charles hanging on to the raft like in an old-time movie- nothing but whites, greys, and blacks. Then back down again as we hit a keeper hole. This time, when I came up, I could see nothing but yellow, as I ended up under the boat. Using my hands to walk backward, I was able to push the boat forward and grab some more air. I kicked hard to catch an eddy and got flushed out on the far bank. Crawling up on the lava field, I couldn’t see anyone. Given my rough ride through the rapids, I was really scared for the rest of the team. Unable to see them, I headed down the lava field picking my way slowly, still shaken and with unsure balance on the sharp rock. After a while, I saw a light on a packraft and Daniel paddled over to ferry me to the other bank. Confirming everyone was safe was a huge relief. Safe, yes, but also shaken, stirred, and shattered. The swim in the dark had been rough for everyone. A stupid decision to run the rapid, really. We did an inventory check- two packs missing, two paddles missing. We picked our way down to the boat takeout and got on our bikes for the short ride to the finish. Between the extreme sleep deprivation and recent trauma, what should have taken 30 minutes took us over three hours as we rode in circles in our compromised condition. At last, we crossed the finish to a warm burrito and a few hearty souls that were still crawling around at 1:00 AM. Naan bread, yoghurt, coffee, and kebabs are not the food you typically think of when it comes to China, but in the far northwest part of the country, the evening air is rich with the smell of billowing smoke from the kebab stands. The hillsides and mountain valleys evoke a familiar Canadian-Swiss feel and a sprinkling of yurts reminds us that the way of life of the Turkic-speaking Muslim people is a notable presence amongst the encroaching Han Chinese population. Sticking out like sore thumbs are a group of foreign athletes busily gathering last-minute supplies for the upcoming 500km+ XTrail Expedition Adventure race set to start in these very hills in two days time. The trek to the start line in Xinjiang Uyghur Autonomous Prefecture was a discipline in itself- but after two days of travel from North America, Roy Malone, Charles Triponez, Jim Driscoll, and myself were packed up and ready to see if this winter’s hard training would pay off. With a collective 60+ years of racing experience under our belts, Team Bones was keen to toe this remote start line that had the potential to keep the podium in sight amongst a starting lineup of world-class athletes. As a World Championship qualifier (not to mention being the biggest dispenser of prize money on the Adventure Racing World Series circuit), the XTrail start line was peppered with the best in the sport, all keen to test themselves against China’s varied landscape. After a nervous bus ride and a colourful opening ceremony featuring jaw-dropping Tuvan Throat Singing, we were off on a Le Mans-style 3km run to the shoreline of Kanas Lake for the beginning of a 25km out-and-back paddle through glassy emerald waters. Paddling is not known to be the forte of North American adventure racers and we were happy with our 8th position at the beginning of Stage 3’s white water rafting section. This is where our secret weapon, Captain Malone, was unleashed in full force. Supplied with recreational rafts that might have been bought at a local toy shop and small wooden paddles that looked like they were whittled by local tribesmen the night before the race, we set off down a class 3 section of the Kanas River. With graceful style, Roy maneuvered our boat through the fast-moving waters with very little drama while the other boys and I played our part in providing the horsepower to muscle through the waves. Our newly-formed foursome really came together during this section as we needed to manage to bail out our boat while holding down the detached floating subfloor to keep the raft from folding in half. The scenario provided us with some good laughs and so with child-like smiles on our faces, and a joyful feeling of team cohesion, we pulled into the next Transition Area (TA) having caught a bit of time on the teams ahead of us. Next up was a 50km trek that would take us up over the grassy hillsides and high open plains southeast of Kanas Lake. We fell into a good pace as we traveled up from the TA, finding the first checkpoint in a high saddle which afforded amazing views of the river valley below. It was here that Jim was able to start really getting his head into the maps, which was no easy feat as they were at 1:100,000 scale and over 60 years young. With major roads and trails often missing (and even mis-mapped contour lines), Jim said using the maps was an exercise in extrapolation. Watching him feel his way through them with efficiency and confidence was an impressive sight and his skill would continue to impress throughout the entire race. The team was working well while we traveled across yurt-studded terrain. The day’s earlier exertion caught up to Charles a little bit as he was still waiting to fall into his stride with the trekking. I myself was suffering from a chronic cough which had plagued me since my travel over to China, but I was managing it with a steady stream of lozenges and good hydration. We weren’t the only ones suffering at this point: we passed Columbia Vidaraid on a steep uphill track with a very low looking Marco on tow behind his teammates. The rest of the team looked okay with Julia carrying her fair share of team water bottles plus some extras to take up her share of the load. As we cruised higher over the hillsides the skies darkened and the evening sky was pierced with impressive flashes of lightning and the sound of deep rumbling thunder. I was secretly counting the seconds between the two (one Mississippi…two Mississippi…) and hoping that our colourful bodies weren’t tempting target practice for the Asian God of Lightning Strikes. The rain came, along with a cold wind, and we found ourselves taking shelter inside tightly drawn hoods as the rain gave way to hail. Picking up the pace is the only remedy for fighting the cold, and Jim made some good navigational choices that had us gain yet another spot on the leaderboard as we descended to an alpine lake with Team Bivouac Inov-8 trailing behind. Some of the most beautiful race scenery revealed itself here as the rain slowed and rainbows appeared on the horizon. As night fell, we made our way to Altay’s historic Hemu Village for a small section on an Orienteering Map. We didn’t know it at the time, but Hemu is the home of the Tuvan Minority in Xinjiang province. The Tuvans are of Mongolian descent (they’re said to be relatives of Genghis Khan!) and their villages have recently become tourist attractions with income from this enterprise virtually doubling their per capita income in the last 6 years. It would have been lovely to have seen their wooden homes and historic way of life in the early morning light, but we had a race to get on with. TA4 saw us transitioning to, what was to be, a 260km bike ride. Even though we were only 14 hours into the race at this point, we’d all agreed that it somehow already felt longer than this and so we knew that achieving our goal of top 5 was going to necessitate taking good care of ourselves and each other. We were in fourth place, but only an hour and ten minutes behind the second place team at this point and we had some quick teams hot on our heels. We hurriedly assembled our bikes and attempted to stuff some good food into our mouths. Unfortunately, Charles’ eagerness with this freeze-dried meal was too much for his stomach, and he lost a good chunk of calories just as we were leaving the TA. Running low on fuel was tough for him as only 15kms out from the transition the trail mutated into a vertical climb out of the valley bottom. As we got off our bikes and started pushing, I looked up into the dark night and thought I saw some stars directly overhead, but no, it was headlamps (likely those Sneaky Weasels’), and the steepness of the bike push was put into perspective. 500 vertical meters later we were at the ridge top after what was likely the 2nd hardest bike push I’d done in recent history (it fell slightly short of the muddy nightmare seen in Costa Rica circa 2013). Fortunately, what goes up must go down, and Charles regained his strength and his bike prowess shined as we cruised down the techie descent. It became obvious that Team Columbia Vidaraid had recovered from their trekking troubles early in the race, and it turned into a long day of cat and mouse as each team took turns taking the lead along the next 60-70kms of rocky road to the noodle house where we were to have a mandatory 2hr stop. We were very conscious of their presence, and as the steep mountain hills were giving way to dry dirt roads we worked hard to stay ahead. Unfortunately, we’d make the mistake of forgetting to bring chain lube on this long bike leg, and as our drivetrains began to complain even louder than our tired legs, we knew we had to find a way to get our hands on some oil. I think Jim was wishing that he’d brushed up on his Chinese bike mechanic vocabulary as we wondered how we were going to ask a local for some help. Luckily, our skill at charades triumphed. We found a very helpful local man who handed us the most perfect water bottle full of engine oil. He’d even pierced a hole in the bottle cap for easy of application to our chains! To top it all off, we used his fresh water hose to fill our water bottles and douse our heads to ward off the hot midday sun, and then we were quickly on our way before Columbia rounded the corner and could benefit from the oasis we’d found. Running smoothly now, we pedaled hard into the noodle house with Columbia right on our tails. The mandatory break here was dreadful as there was no shelter from the hot sun (when we arrived, the Estonians were still there, sleeping under a large truck). We made the most of this stop and filled our bellies with fresh hot food and managed to lay down in the shady eve of the building and at least rest our eyes as the crawling ants kept sleep at bay. After the noodle house, the hilly mountain terrain turned to a hot desert badland. We were downing the water and I was resisting the urge to dump my bottle over my head as the sun climbed higher in the cloudless sky and the thermometer pushed 40C. I was enjoying that Columbia was still right with us, as it forced our focus to stay sharp in these conditions after over 24hrs of racing. Traveling so closely with another team at a race like this does have its pros and cons; it allows you to size up the state they’re in, but it also allows one team to benefit from the navigational or strategic choices of another. In an attempt to shake them off our tails, Jim cleverly stopped to adjust the map (and let Columbia pass) just before a sneaky left-hand turn. The trick worked and Columbia missed the turn, but they didn’t take long to realize their mistake and they caught back up just as we descended into a scenic canyon that saw us zipping back and forth along a refreshingly cool stream bed. The game went on for quite some time, but we ended up being the losers when we gave away 2hrs in trying to find a mapped road through a town that just no longer existed. The midges were now out in full force and any time we were moving less than 10kph on our bikes they were buzzing and crawling into every nook and cranny of exposed skin, up our noses, and into our eyes. Standing still to take a good look at the map was absolute torture and significantly added to the stress of finding the lost road. Our sweat and stink made us especially inviting targets for the little black buggers, and any attempt at trying to get directions from locals while surrounded by the dark cloud was met with shock (or was that pity?). We eventually took a conservative route around the back of town that definitely added some extra kms, but in characteristic Bones fashion, we brushed off our error and concentrated on the next task: getting to the end of this bug-infested bike ride and onto the next paddle. Rolling into what is now known as the “Worst TA in AR History”, I now know that we were one of the lucky teams who arrived within a relative lull in the mosquito infestation. Columbia Vidaraid was here as well, and we heard some commotion with the boys shouting commands back and forth to each other in Spanish. It seemed something was up and rumour had it that Julia wasn’t feeling well. At 37 hours into the race, we were also desperate for some sleep, and so got ourselves organized as quickly as possible and arranged for a private yurt in which to lay our weary heads. It was a complete bug-free luxury with pillows and comforters and we settled in, stuffed some delicious freeze-dried meals down our gullets, and snuggled up for a solid 1.5hrs of shut eye. It’s amazing how in regular day-to-day life the alarm always comes too early, but while racing, it’s just another starting gun. We shot up and quickly got back into action cleaning our feet and applying lube to various nooks and crannies of our lean bodies before getting dressed for the next kayak leg. One of the biggest pleasures we had during this race was to have the supportive presence of Roy’s daughter Tegan and Charles’ wife Mary Kate along the way. Not only had they endured the inconveniences of living with someone who, for months, have been consumed by training and planning for a major expedition adventure race, but they’d then decided to spend countless hours in airports, buses, and crowded hotel rooms so they could stand beside us at the start line. The sight of their beaming faces waiting for us when we came into TAs was enough to fill our hearts with joy and light up our own smiles and this one was no different. We busily did our gear-sorting business while they regaled us with harrowing stories of the last two days of Chinese travel nightmares, camel sightings, and late evenings of baiju (Chinese grain alcohol) fuelled festivity. Personally, the presence of other women is always a bonus as even a little conversation outside of the masculine is a warming pleasure. It was the darkest part of night as we climbed into the kayaks for a 15km paddle on Ulungur Lake (one of China’s largest freshwater lakes) to the start of a trek that would see us cover 40kms through arid desert hills. The water was calm and the bugs seemed to have settled down for the night, making paddling a breeze. Unfortunately for the team, my singing voice was batting under par during this section. I’m pretty sure the acoustics of a calm Chinese freshwater lake rivals even the finest of cathedrals and had my hacking cough not turned my laryngeal vocalizations into something approximating out-of-tune bagpipes, the three of them would have been thoroughly entertained by an endless stream of Canadian pop music hits. TA 6 was a quick hop out of the boats and back onto our running legs. I will admit that I was nervous about this section; a scorchingly hot trek through dusty shadeless hills while being swarmed by cannibalistic mosquitoes was not the most appealing way to spend my spring vacation. I cursed that blazing ball of light as dawn arrived and it slowly crept up over the horizon and wondered how we’d make it through. We prayed for rain. The first CP came easily enough as Charles “Eagle Eyes” Triponez somehow miraculously spotted it nestled into the side of a hill in a place where we weren't exactly expecting to see it. We realized that we got lucky when, after swiftly “punching” the checkpoint with our electronic wristbands, we noticed Bivouac Inov-8 on an adjacent ridge looking like they’d lost their puppy. They’d passed us the night before while we slept in our yurt and fatigue was obviously playing a part in their game. We were feeling thankful that we’d decided to spend longer in the last TA to rest our bodies and minds. As the clock never stops running in the Adventure Racing game, taking time out for sleep can sometimes feel like a gamble, but giving your brain that extra little energy bump can pay off in spades. With a renewed spring in our step, we continued along through the desert. The morning sun was feeling hot on my skin and the blanket of mosquitos was beyond taking their toll- it was driving us mental! Jim pointed out where the next CP was in some distant hills on the horizon and I couldn’t help but notice that there was nary a shade-throwing tree between us and that flag. With no storm clouds in the sky, I accepted that my prayers for rain were going to go unanswered when the wind suddenly kicked up out of the west. I’d been in wind storms before, but I’m not sure I had ever experienced a constant gale quite like that. With wind speeds reaching over 100kph, those pesky mosquitos didn’t stand a chance and the heat of the day was blown away with them. We trekked head-on into the invisible force and held tightly onto our hats. CP 27 was located on a height of land beside a wind farm (I guess the wind wasn’t that unusual) and it was here that we received a message on our Yellow Brick telling us that the wind was causing unsafe conditions for any boat travel on the lake and we’d have to trek back to TA 8 instead of paddle, adding an extra 15kms to our 40km trek. This also meant that any team who was not already on this desert trek (there were only 5 teams that had made it this far) would be running a different race course than us. If we made it through to the finish line intact, we would be guaranteed to place in the top 5. All we had to do was stay focused and healthy and continue to race strong. 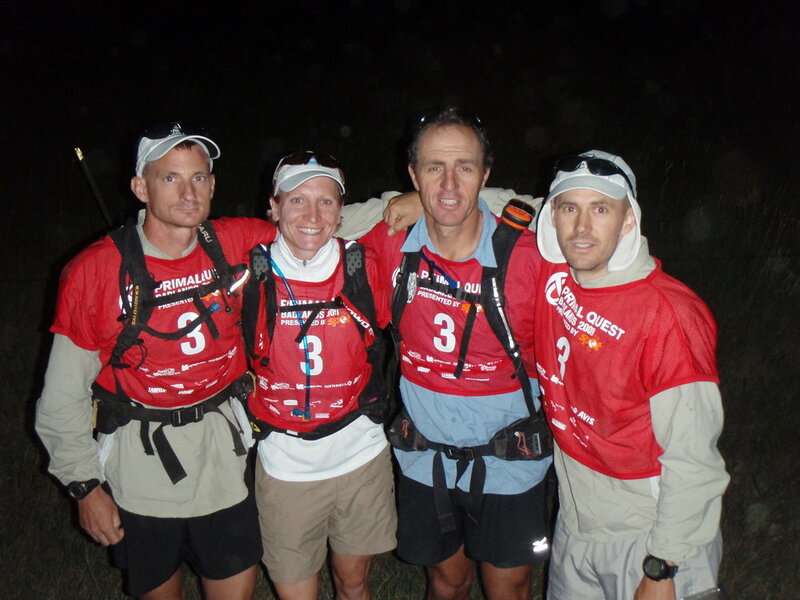 The next couple of CPs would have been straight forward enough had it not been for the relentless wind, poorly mapped terrain, inaccurate contour lines, and all four of us running out of water and facing dehydration. We were relieved to arrive back at the lakeshore for a quick refill on water, and our dusty tired bodies relished the coasteering route we chose back to TA 8; we scrambled, jumped, and climbed along the rocky cliffs and soaked up the coolness of the lake. At this point, I’d completely lost my voice and my cries of joy were reduced to a grinning whisper. The wind was still howling even after we arrived at TA8 and started transitioning to our bikes. It was there that I had a minor disaster when we learned that there had been an error on the logistical plan that was distributed prior to the race start. It had said that our bike boxes would be available at this TA, and apparently the mistake was sorted out in the pre-race meeting, but our entire team seemed to have missed this detail. I stood there and scratched my head as I pondered the reality of doing the next 150km bike ride with no padded bike shorts when I remembered what was at the bottom of the gear bin; the bike shorts I’d just taken off before the desert trek. Still ripe from the sweaty 240-odd kilometre ride from the day before, these babies had been marinating in discarded food wrappers and dirty socks in the bottom of the hot gear bin. To say that pulling them back up over my backside was a bit distasteful would be an understatement. Ah, the joys of adventure racing! Our biggest challenge on this next section was the wind. The TA flags were whipping and fraying and gear bin lids, water bottles, and any gear let loose from your hand were instantly blown away. I will admit that I was feeling quite uneasy as we rolled out of the TA and out onto the busy roadway. We had about 60kms on unsheltered highway and the idea of a gust coming along and knocking me into traffic was terrifying. It seemed that the guys weren’t nearly as scared as me, and I’m not sure if it was the fatigue at play, but without Roy there right behind me telling me that everything was going to be okay, I’m pretty sure I would have entered the meltdown zone. With his encouragement, I was soon enough battling right back with the wind in some kind of invisible arm wrestle that I was determined not to lose. Leaning our bikes hard when the gusts came, we remained solid throughout the ride, taking turns pushing at the front of the peloton and keeping spirits up when the headwind reduced our speed to a meagre 7km/hr, and revelling in the joy of passively travelling at close to 30kph when it was at our backs. Tarmac eventually turned to a dirt track and we pedaled as fast as we could so as to take advantage of daylight. Jim once again amazed us with his precision navigating and we seemed to be flying through the evening with very little trouble. The third sunset of the race came and went, and as we pedaled on past our 60th hour of racing, the stress of the unrelenting wind (now mixed with slashing rain) was beginning to take its toll. With our lips turning blue in the chill of the night, we moved quickly to get out of the exposed higher elevation as fast as possible and decided to take a timeout in a little building we found off the side of the road. Opening the shabby wooden door revealed a momma cow and two calves and the quiet warmth of the place immediately had us craving sleep. We decided that the complexity of the next little section of biking was best faced with rested minds and we lay down with the cows for what turned into a 3hr nap on the warm dirt floor of the barn. The push to the finish line in Altay was an epic adventure through a deep canyon. We had a little bobble up the wrong drainage after a local farmer convinced us that it was the way to go, but quickly got back on track and hit the final CP in one of the most beautiful alpine meadows I’ve ever seen. We witnessed a local horseman and his black stallion galloping across the plateau and I remembered again how lucky we were to be able to see these places that are so far out of reach to so many. As this story is getting too long, I won’t tell you about nearly losing my left leg to a sinister dog (or was it a wolf? that sucker was HUGE! ), and instead will continue with the glorious feeling of the finish line and the taste of cheap Chinese champagne. The finish line feeling is always a mix of happiness, relief, and heartache. The first two are obvious, but the third is the one that is the most difficult to describe. During our 72hrs of racing, Roy, Charles, Jim, and I formed a special bond that can only be formed by sharing such a deep experience. The finish line symbolizes a boundary between the magic of an epic unplugged adventure into the wild with some of your closest friends and the real world of adult responsibility. It is true that it might be called escapist, or possibly even a selfish way to spend your time, but those moments deep in the race course when you find yourself discovering your capacity to push yourself beyond what you thought was possible, the desire to sign up for yet another adventure becomes clear. As we sipped the sweetness of our victory bubbles, we were thankful for all that helped us get here; our friends and family for being extremely patient yet excited supporters of our endless adventures, and our bodies for holding amazing talent and strength. I thank my teammates for being simply extraordinary. I’m looking forward to toeing the line with you all again.